There are numerous factors that make schools the top philosophy schools. When international students seek to attend the best philosophy schools they should take into account these numerous factors and find the one that is not just the "best" but the best for them. Finding the best school of philosophy at which to study can be a difficult process. There are at least four major concerns that one should consider when choosing a school: 1) School Ranking 2) Price 3) Focus and 4) Degree level. The school ranking can be easily determined online; however, it does not take into account the culture, environment, and fit of the school for the students. Price varies greatly from school to school, and can be of special concern to international students who have to pay full tuition rates; however, there are financial aid opportunities. There are many different kinds of philosophy and different schools focus on different types of philosophy, so potential students must check the focus of the philosophy department to make sure it is a good fit. Finally, there are significant differences between pursuing a philosophy degree as a BA, MA, or PhD, which will affect what school the student should consider. This is all to say that when considering the top philosophy schools, potential international students should consider the best philosophy schools for them! The top academic rankings of a school can be obtained pretty easily through the "Philosophical Gourmet Report". The Report is an online peer-reviewed source, which is ranked by the top philosophers in the world. The schools and philosophy departments reviewed by the schools are ranked solely by the prestige and philosophical merit of the faculty themselves. The "top" school of philosophy in the U.S. is New York University. Reviewing the Report, one can see pretty easily that most of the other top philosophy schools are generally Ivy League schools, but as in the case of NYU, not necessarily. 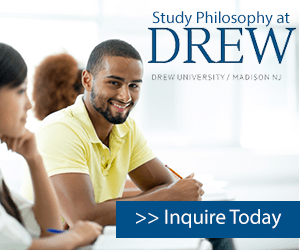 Attending one of these top philosophy schools will mean that the student studies with famous and well-published philosophers, and he or she will earn a degree that is well-respected in the field, and outside of it. However, simply because a school is top rated does not mean that it is a good fit for the student. Some international students prefer a smaller setting that emphasizes problem-solving and critical thinking skills. SUNY Brockport	has a small but dedicated faculty where students get small sized classes to encourage discussion and thought about political philosophy, medical ethics, Asian philosophy, Ancient Greek philosophy, modern philosophy, and other areas. As part of this hands on approach, SUNY Brockport offers a premier lecture series that brings well regarded philosophers to discuss their findings and encourage the debate. International students should also be aware of pricing when considering a school. Many philosophy departments who are looking to recruit international students may offer scholarships to those who are hard working with good grades. What the school will be most interested in on the PhD level is the quality of thought that the student produces through writing. International students should be sure to explore all financial aid options, their ability to pay, and what the true cost of their education will be before committing to a school. Top schools for philosophy should be evaluated based on their focus rather than overall ranking. A student who is considering a graduate degree should not attend NYU just because it is the top school as it may not offer the branch of philosophy he or she wants to pursue. Potential students can review the philosophical gourmet report not just by overall ranking, but by department, too. A school that is ranked relatively low in the overall rankings might rank #1 in a specialty philosophy field. Florida State University, for example is low on the overall rankings, but is ranked #1 in "Action Theory." For this reason, students pursuing a philosophy degree should be careful to make sure that the top school focuses on their areas of interest. Students should take the time to contact by phone, email, or, preferably, in person, the faculty member with whom they would be studying. A low ranking school might have a fantastic faculty that is top in its particular field in philosophy, and most importantly, is highly supportive of its student body. The importance of attending a top school of philosophy differs between degree levels. For example, only a few schools offer Master's degrees in applied philosophies, because it is a specialty field. Undergraduates should not be too concerned with the rankings of top schools, if their goal is to become professional philosophers. A student with a BA from a lower ranking and affordable school still had a good chance of acceptance in one of the top philosophy schools if his or her thoughts are philosophically sounds and writing is good. Potential graduate students, however, should give a great deal of time to thinking about the ranking in the report of the best philosophy schools. These students should take the time to consider what areas of philosophy are their strengths and consider applying to those schools ranked highly in those areas. The application process should include contacting the department and speaking with the faculty who specialize in the student's area of interest. As it is highly likely that the student will be working with that faculty member during the years of his or her dissertation, it is important that the student and faculty are a good fit together.